Washington, D.C. – As the tragic death toll of the nationwide opioid epidemic continues to rise, local law enforcement agents from Florida to Oregon are warning about the growing prevalence of synthetic drugs shipped through the mail. Facilitating easy access to toxic opioids is a major security gap in the global postal network, which provides a pipeline for foreign bad actors to ship drugs into local communities. According to the Department of Homeland Security, over one million packages reach the United States though foreign posts every day without the advance electronic security data that would allow law enforcement to identify packages containing hazardous materials. As a result, powerful synthetic opioids like fentanyl and carfentanil can be produced in foreign laboratories, purchased on the “dark web” and shipped through the global postal network to homes across the country, often undetected. As law enforcement and first responders grapple with the crisis at the local level, our federal government must also do its part to support their efforts. 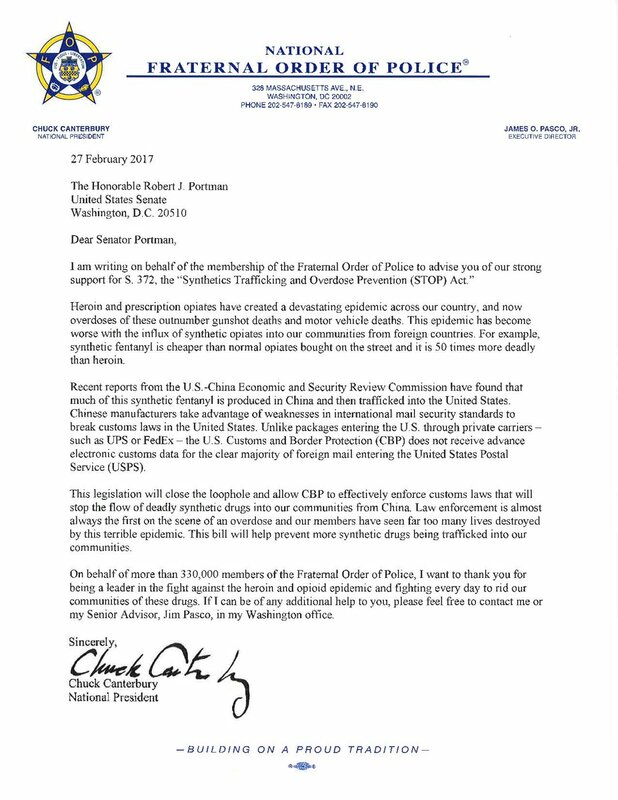 That’s why those on the front lines of the crisis, such as the Fraternal Order of Police and American Medical Association, support the Synthetics Trafficking & Overdose Prevention (STOP) Act, which would require all packages shipped through foreign postal services to include vital security data. Americans for Securing All Packages (ASAP) urges the White House and Congress to support local law enforcement and stop the flow of these drugs by taking decisive action to close the loophole before more lives are lost.